Explain the benefits of a knowledge base. Explore Lightning Knowledge in the trial org. Ada Balewa is a support agent at Ursa Major. She appreciates the power of knowledge. After all, she built her career on using her knowledge to help customers. Ada knows a lot. But there’s just one Ada and so many customers. That’s why she’s excited when Maria Jimenez, her systems admin, calls a meeting to talk about Lightning Knowledge. Maria wants to implement a knowledge base. Think of it as a giant library with the most helpful librarian possible. A librarian who can quickly answer everyone’s questions. At Ursa Major, Ada is that librarian. Her answers will form the basis of the Ursa Major knowledge base. Ada’s notes cover these questions and more. She’s excited to turn her notes into articles. Then she can easily share them with anyone who needs the information. Who sees her articles? Other agents, customers in communities, or customers searching on a public website. At Ursa Major, many customers call in with simple questions. Without a knowledge base, Ada spends a lot of her day answering the same questions over and over. Even worse, sometimes customers have to wait to get those answers. Ada hates making her customers wait. Once Ursa Major sets up a knowledge base on their website and other channels, customers can quickly find answers to the easy questions there. If they can, most customers prefer to answer questions themselves instead of contacting technical support. Finding answers quickly makes customers happy. If basic information is easy to find, then Ada is free to spend more time helping customers with new problems. As a result, those customers are happier, too. That’s the kind of sunshine and happiness Ursa Major loves to see. Ada often trains new support agents, so she knows there’s a lot to learn. Ursa Major sells many different solar power components. They also handle complex solar installations. It’s tough to keep everything straight. Sure, Ada has her own notes, but they’re not easy for anyone else to find and use. The only way new hires can learn is by asking Ada, so it takes a while for them to be productive. But a knowledge base puts that organizational knowledge into a repository. New agents have a place to go to learn on their own. An up-to-date repository helps you to train new agents quickly and lower the training burden for existing agents, too. Everyone’s productivity increases. With a knowledge base, agents don’t have to research every question from scratch, every time it’s asked. Instead, the first time a question is asked, an agent records the answer in an article. The next time a customer asks the same question, any other agent can find the article in the knowledge base and provide a ready answer. Even better? Lightning Knowledge often suggests the article most relevant to a case so agents don’t even need to search for it. As a Salesforce admin, Maria is excited to use Salesforce Lightning Knowledge. Lightning Knowledge isn’t just your average knowledge base. Sure, it stores information in one place so that agents and customers alike can access it (depending on permissions). It can make her agents more productive and her customers happy. But even better, from Maria’s point of view, is that Lightning Knowledge is part of Salesforce. Because Knowledge is integrated with Salesforce rules, permissions, and administration tools, she can manage everything in one place. After talking to Ada and seeing her collection of notes, Maria installs a trial version of Lightning Knowledge to try it out. Enter the URL for installing a trial version. Click Start My Free Trial. A few minutes later, a trial version displays a list of tours you can use to explore Service Cloud features. Maria clicks a sample case to see what her agents can do in the trial version of the knowledge base. In the Knowledge pane, Maria sees the following tools. Search for articles (1)—Type here to find articles in your knowledge base. For example, type password to find articles about resetting a user password. When you start typing in the search field, a menu pops up. Use it to view recent searches or create an advanced search with filters such as language or publication status. Create an article (2)—If an answer isn’t in your knowledge base, create an article to add it. Sort your search results (3)—Click to sort your results alphabetically from A to Z or by publication date. Suggested articles are already sorted by relevance. View details about each article (4)—See the article’s title, summary, and properties. 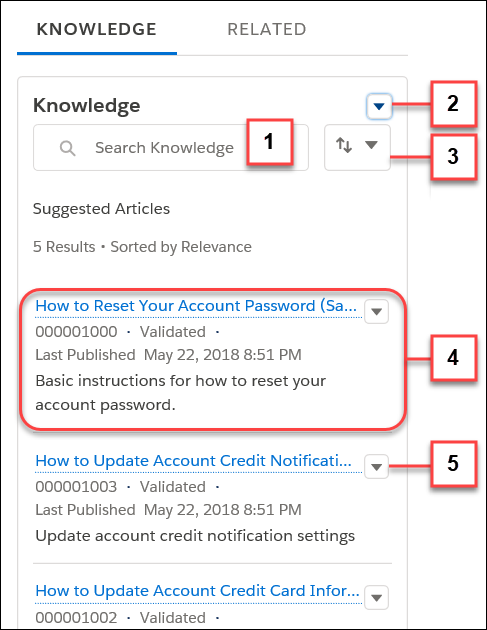 In this case, the article is titled How to Reset Your Account Password. Work with the article (5)—Click this menu to interact with the article. Depending on the article’s permissions, you can do a lot. You can edit, publish, archive, attach, detach, follow, or insert the article into an email. Maria likes what she sees. She’s learned the basics about knowledge bases and seen what Lightning Knowledge can do. Lightning Knowledge can really help her agents and their customers. Maria’s next step? Planning the knowledge base for Ursa Major.